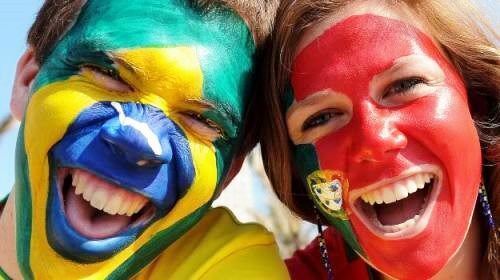 Approximately 250 million people worldwide currently speak Portuguese. 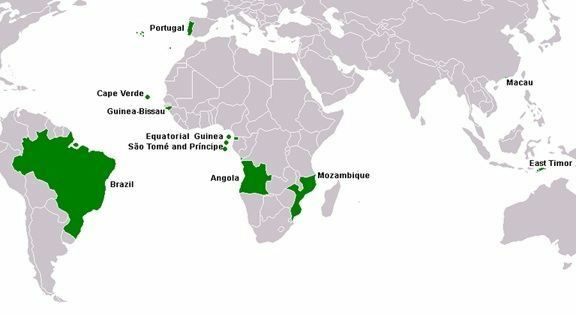 It is the official language of Portugal, Angola, Brazil, Mozambique, the Guinea-Bissau, Cape Verde and São Tomé and Príncipe. It’s also one of the official languages of Timor-East and of the special administrative region of Macau in China. As the result of expansion during colonial times, Portuguese speakers are also found in Goa, Daman and Diu in India and in Malacca in Malaysia. Therefore, no wonder that there are differences in grammar rules, vocabulary, intonation and pronunciation for each of these countries that are so distant from each other. And two good examples of these differences occur when we try to make a comparison between European Portuguese and Brazilian Portuguese. To help you understand, let’s think about American English and British English or, if you prefer, Latin American Spanish and Castilian Spanish. Whether is Portuguese, English or Spanish, they all speak the same language, they all understand each other even with their specific vocabulary or genuine and typical accent. Now, let’s see some main differences between European Portuguese and Brazilian Portuguese. Both pronouns mean the 2nd person singular ‘you’. However, in Brazil, tu is not as common. 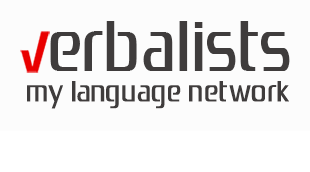 It can be used in some dialects from the North and Southern states whereas in Portugal is used in an informal way among family, friends or colleagues. On the other hand, for Brazilians, você is the standard informal treatment, used daily, among people, on the streets, at work, in all media communications, and with family and friends. But, for the Portuguese, você has a certain formality among people with whom they don’t have a familiar or close relationshipExamples:Hello Maria, you are very cute today! Olá Maria, você está* muito bonita hoje! – BP*Pay attention to the conjugation of the verb because with tu we must use the second person singular but with você we have to use the third person. Eu não me chamo André. Você não se sente melhor hoje? To describe something that you are doing now, Portuguese and Brazilians say it differently. In Portugal, they use the compound tense estar a + infinitive whereas in Brazil, they replaced it with estar + gerund.Eles estão a estudar em casa. Enquanto eu estou a cozinhar, o meu marido está a tomar banho.Eles estão estudando em casa. Enquanto eu estou cozinhando, meu marido está tomando banho. The Brazilian spellings of certain words differ from those used in Portugal and the other Portuguese-speaking countries. Some of these differences are simply orthographic, but others reflect true differences in pronunciation. One of the major differences relates to words with c and p followed by c, ç, or t. In many cases, the letters c or p have become silent in all varieties of Portuguese, a common phonetic change in Latin languages. For example: acção, correcção. acta, actual, objecto, recepção, óptimo, Egipto. In BP, these two consonants stopped being used but in EP they still exist. However, things are changing and EP is slowly losing those silent consonants, mainly due to the new Orthographic Agreement signed between all Portuguese-speaking countries. As it was mentioned before, Portuguese people and Brazilians can understand each other very well, however, some Brazilians might find it difficult to understand the European Portuguese because the Portuguese from Portugal has a bigger tendency to compress words. Another reason is that Brazilians have almost no contact with the European variant, while Portuguese are used to watch Brazilian television programs (films, soap operas, talk shows, etc.) and listening to Brazilian music. These are some of the most important differences between EP and BP. Still having doubts? Grab your things and go for a road trip around Portugal and Brazil. Speak with the natives, and please don’t feel frustrated if you don’t understand what they say. It is perfectly normal, especially if you visit those beautiful small villages where you can find deeper differences regarding the accent. One thing is guaranteed, a true rewarding adventure. [de] at the end of the word is pronounced [dji]. The letter [e] at the end is pronounced [i]. The letter [L] is pronounced [u] at the end of a syllable or word. The letter [s] at the end of the word is pronounced [s].